The long-awaited Mercedes-Benz team arrived at the French GP with the new W196 cars for Juan-Manuel Fangio, Karl Kling and Hans Herrmann. With Giuseppe Farina out of action after an accident Gianni Lancia agreed to release Alberto Ascari to drive for Maserati, ensuring that there was an Italian driver in the race. Ferrari fielded Froilan Gonzalez, Mike Hawthorn with Maurice Trintigant. 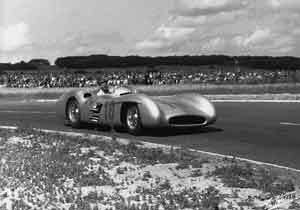 In practice Fangio was fastest from Kling with Ascari on the front row alongside the silver cars. Gonzalez shared the second row with Maserati's Onofre Marimon while Prince Bira did well in his Maserati to record a faster time than Herrmann and Hawthorn. Ascari's race was short as he retired with transmission failure during the first lap which left Fangio and Kling to run away with the race. There was a lively battle for third place with Hawthorn battling with Marimon before he had to retire. The Argentine also had to stop for a change of plugs and dropped to the tail of the field and so Prince Bira battled with Jean Behra's Gordini and Trintigant's Ferrari. Behra made a mistake and went off and Trintigant lost time trying to avoid his countryman and so Bira was able to escape but on the final lap he ran out of fuel and was overtaken by Robert Manzon in a Ferrari who had inherited fourth place when Trintignant went out with engine trouble.